Search the catalog by selecting Search > the Catalog in the Evergreen menu or pressing F3 on the keyboard. The search page opens in the current tab. Here are some important quick facts to remember when searching the bibliographic database. All search terms are joined by and by default. So, a search for harry potter is seen in the system as harry and potter. Boolean operators such as and, or, not are searched for regularly, and are not considered special. Phrase searching is accomplished by double-quoting the phrase. For example "harry potter". To exclude a term from the search, use - (minus). For example, vacations -britain will search for materials on vacations, but not Britain. By default, search terms are stemmed. So, for example, a search for dogs will also return hits with the word dog. This is the default search page, which is the same as the Advanced Search page viewable to patrons using the OPAC. terms or phrases to search for. Each condition is joined by a Boolean and. The search page form shows three conditions by default, but you can add and remove conditions. Add an additional condition by selecting the Add Search Row button. Remove a condition by selecting the X button to the right of the condition. In the Search Filters area, you can apply limits to your search by Item Form (micoform, Braille, large print, etc. ), Item Type (book, audiobook, video, etc. ), Literary Form (fiction, non-fiction, etc. ), Language, and Audience (adult, juvenile, etc.). For some of these categories, only a small set of the most common values are displayed; select the Advanced link under the category to see all possible values. In the Sort Criteria area, you can choose in what order the search results should be displayed: Relevance (most to least relevant), Title (ascending or descending), Author (ascending or descending), or Publication Date (ascending or descending). In the Search Library area, you can choose which PINES library or libraries to search. You can choose a specific branch, a local library system, or all PINES libraries. You can also combine related search results by selecting Group Formats and Editions or retrieve only records for items available by selecting Limit to Available. For a discussion of how bib searching actually works internally, and some advanced syntax examples, see this page describing the grammar and configuration. On the left, there are other options for searching: Quick Search and MARC Expert Search. 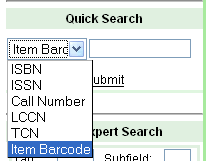 Quick Search allows you to search by ISBN, ISSN, Call number, LCCN, TCN, or Item Barcode. Simply select the type from the drop-down menu, enter the full or partial number, and select Submit to perform the search. 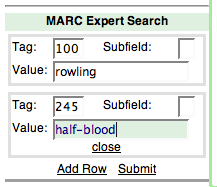 MARC Expert Search allows you to search using MARC field and subfield codes. Enter the field (subfield is optional) and the text to search for, and select Submit to perform the search. You may also search by additional fields (combined with and) by selecting Add Row. The search results are the same as the results pages viewable to patrons using the OPAC. 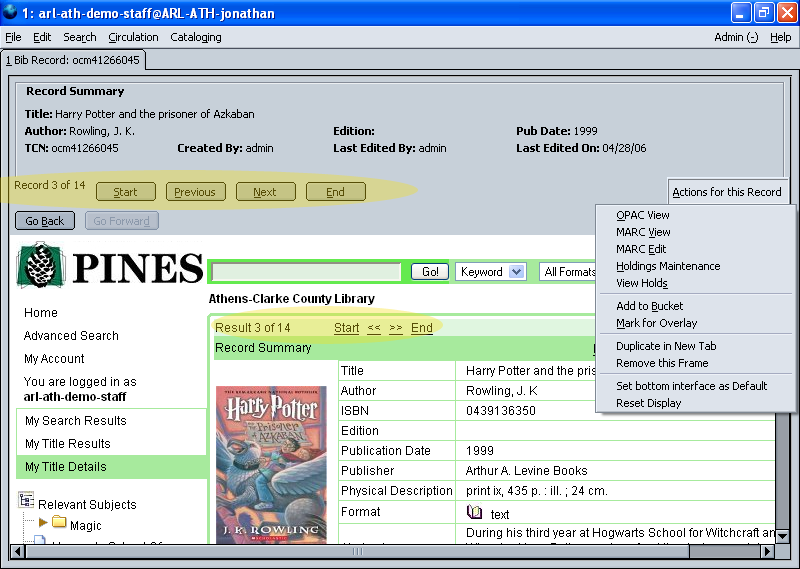 See How to Search the OPAC for more details on the features available. You can view additional information about the title, such as the TCN and information about when the record was last edited. You can use the Start, Previous, Forward, and End buttons to step through the titles in a title group, in the same way that the corresponding links in the OPAC view work. OPAC View – Switches to the OPAC view (the view shown in the images above). You can switch back to the OPAC View by selecting this option if you are currently viewing one of the other items below. MARC View – Shows the MARC record for the item. MARC Edit – Shows the MARC editor for making changes to the MARC record. Holdings Maintenance – Shows the Holdings Maintenance view for the record. See Adding and Maintaining Copies and Volumes for more information. View Holds – Shows the holds for the record. See Holds for more information. Duplicate in New Tab – Opens the record (in its default view) in a new tab. Remove this Frame – Removes the top information frame and shows only the bottom view. Set bottom interface as default – You can choose which view should be the default view for records: OPAC, MARC, MARC Editor, Holdings Maintenance, or Holds. Set the current view to whichever you prefer, then select Set bottom interface as default. Then, when you open item records, the display will use that view. Reset Display – Restores the system defaults, removing preferences you have chosen using the options above.